Many businesses have a need for a reliable, instant, plentiful hot water supply. Australian Hot Water are experts in the field of supply & installation of commercial hot water tanks & systems. We are official suppliers of all the world’s best hot water system manufacturers, so we can offer a commercial hot water solution that fits your needs. Australian Hot Water supplies & installs a wide range of solar water heaters. The Australian Hot Water solar water heater range is both innovative and highly efficient. If you would like some expert advice on fitting a solar hot water system just call 13 21 13. The average business uses their water heater many times, every day. For that reason it is important you select the most effective and energy efficient water heater for your commercial needs. Because Australian Hot Water supply and install commercial hot water systems from all of the quality water heater manufacturers you can be sure that we have a product to truly fit your needs. Branches are strategically located to service all areas of Sydney, Melbourne, North Coast NSW, Gold Coast QLD, Canberra, and Newcastle. Service centres are located in Sydney at Alexandria, Belmore, Caringbah, Leumeah, Moorebank, Mona Vale and Seven Hills, Port Melbourne, Cardiff in Newcastle, Fyshwick in Canberra, in regional NSW at Ballina and Lorne and in Burleigh Heads on the Gold Coast QLD. Australian Hot Water have been in the hot water business for over 25 years and therefore have vast experience with servicing and repairing commercial hot water heaters, even commercial water heaters that have long been out of production. For all your commercial hot water system service & repair needs call the name you can trust, Australian Hot Water. Remember we service & repair commercial hot water systems from all the top manufacturers. A commercial solar system normally involves a mix of both solar and conventional water heating, with the size of the latter being sufficient to provide all the hot water demands for the project under the most adverse weather conditions expected. In most states of Australia, it is now normal for design engineers in both private organisations and government to thoroughly investigate the feasibility of solar water heating for all new projects. A choice of gas or electrical boosting is available by installing the appropriate water heaters downstream of the solar storage tanks. 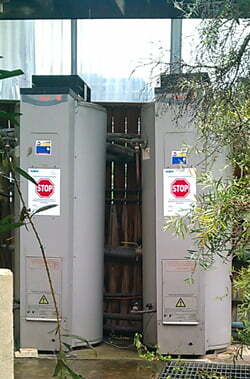 These are connected in series with the solar storage so all the water passes through these boosting water heaters. Under good solar conditions, the thermostats on the boosting water heaters will "recognise" the preheated water and no heating will occur except for maintenance operation. If, however, unusable water enters the boosting water heaters, the thermostats will react and boosting will take place. The thermostats on these units are set down to the minimum usable water temperature in order to get the maximum solar contribution. The government offers various rebates & incentives to help encourage people to fit Solar Hot Water Tanks & Solar Hot Water Systems. Click here to find out what solar hot water rebates that you may be entitled to.